The CBOE equity put/call ratio fell to 0.53 yesterday, the lowest reading of 2015. A ratio of 0.53 means that option traders bought 1.89 calls (bullish option bet) for every put (bearish option bet). Put/call ratio extremes are generally a contrarian indicator. Although it’s the lowest reading of the year, 0.53 is not extreme by historical standards. The chart below plots the S&P 500 (NYSEArca: SPY) against the CBOE equity put/call ratio. The dashed red lines highlight what happened the last three times the put/call ratio was around 0.53. 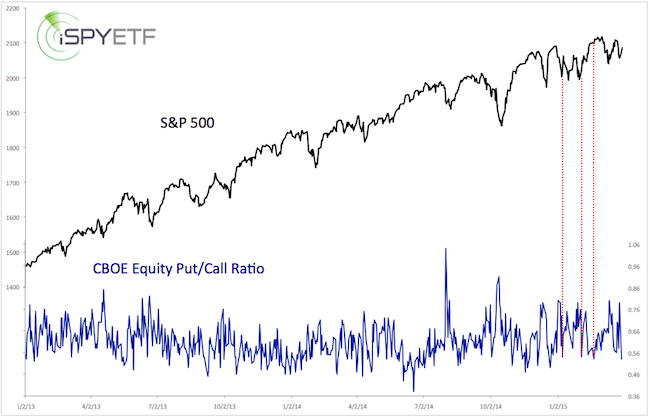 In general, the put/call ratio needs to drop into the mid-40s to predict trouble with a measure of consistency. The iShares Nasdaq Biotechnology ETF (Nasdaq: IBB) lost as much as 15% since last Friday and is now at a rare short-term oversold level. Over the last year, there were only four times the RSI 2 dropped below four. The vertical green lines highlight the prior instances. It led to a rebound every time. The chart also shows strong support (various trend lines and 50-day SMA) just below current trade (330 – 333). 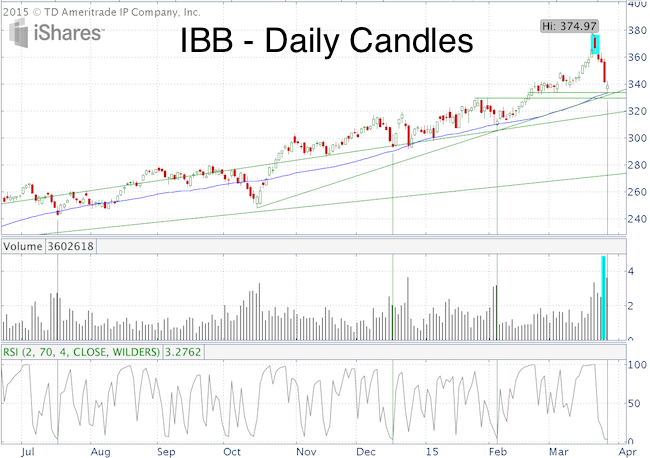 If history repeats itself, IBB should bounce here. But will this time be different? This red candle high is still in play and volume really picked up during yesterday’s selloff (which could also be interpreted as washout decline). Biotech shorts already pocketed nice gains, but as long as support holds, odds favor at least a bounce. Only a drop below will unlock further down side. All for one and one for all may have worked for the Three Musketeers, but it’s not working for the Dow Jones Averages. All three Dow Jones Averages are pulling in different directions. 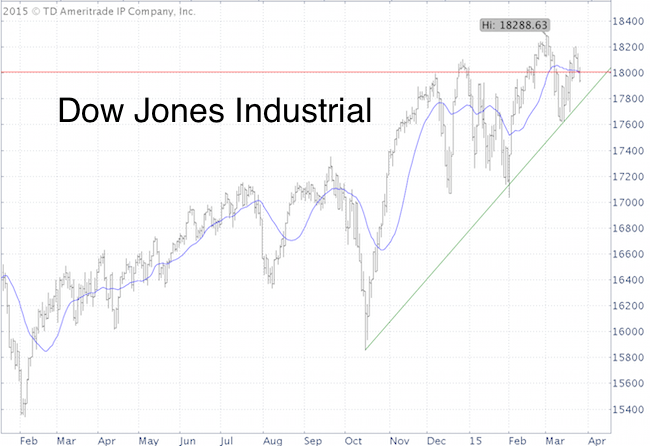 The Dow Jones Industrial is near its all-time high. The Dow Jones Utility just came off a nine-month low and the Dow Jones Transportation Average has been stuck in neutral for four months. Here’s a look at all three averages and an attempt to interpret the meaning of the broad Dow Jones disharmony. 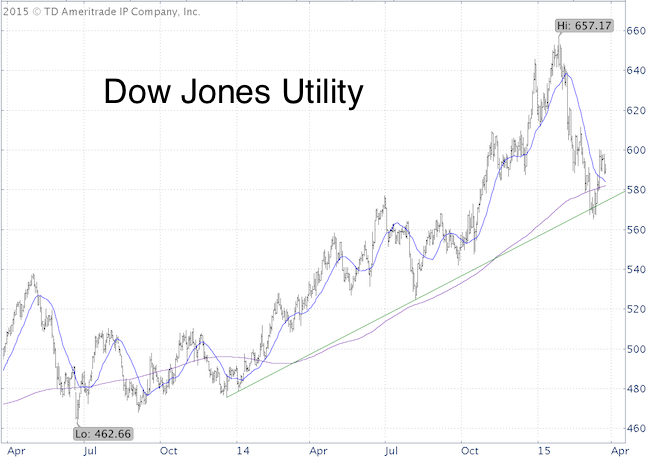 The Dow Jones Utility Average (DJU) lost as much as 14% from January 28 to March 11. 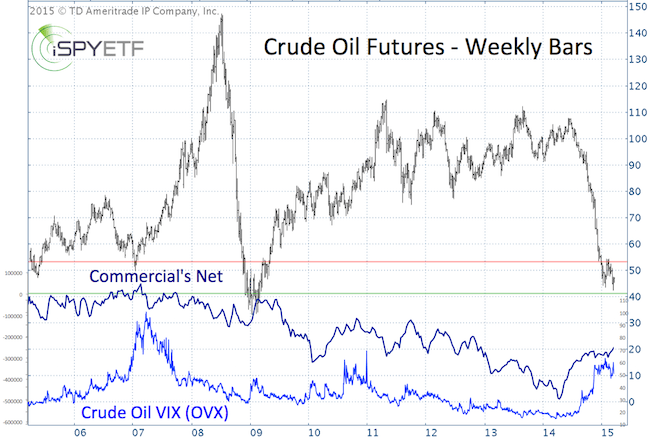 The latest rally started on March 12, and as long as support at 585 – 574 holds, DJU may continue higher. 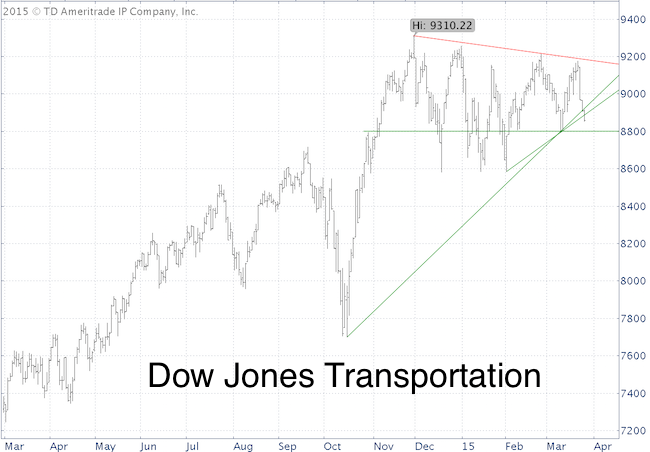 The Dow Jones Transportation Average (DJT) has been stuck in a multi-month triangle, and is threatening to close below triangle support. A break down below the ascending green trend lines has to be graded bearish (unless it reverses). Next support is at 8,800 and 8,600. The iShares Transportation Average ETF (NYSEArca: IYT) tracks the DJT. The Dow Jones Industrial Average (DJI) just fell below long-term Fibonacci support/resistance at 18,004, which is also where the 20-day SMA is. This allows for continued weakness. The SPDR Dow Jones Industrial Average ETF (NYSEArca: DIA) tracks the DJI. 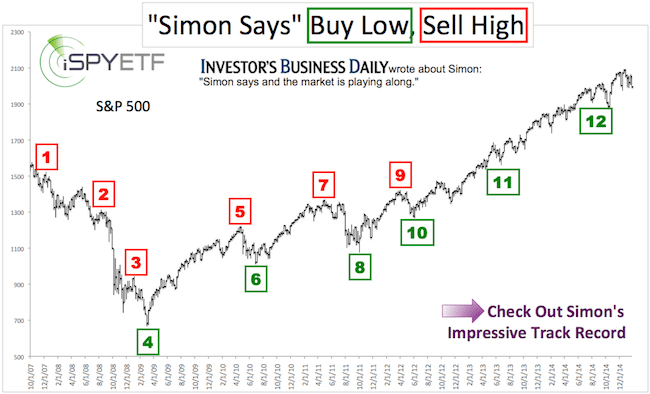 The lack of confirmation among the Dow Average isn’t a bullish development, but thus far the key U.S. indexes are not displaying signs of a major market top (for more details about the indicator that’s identified the 1987, 2000 and 2007 tops go here: Is the S&P 500 Carving Out a Major Market Top?). Until we get the same kind of deterioration seen at prior bull market highs, divergences among the Dow Average may just be a distraction. The 30-day VIX (VIX) is trading 23% lower than the 90-day VIX (VXV). 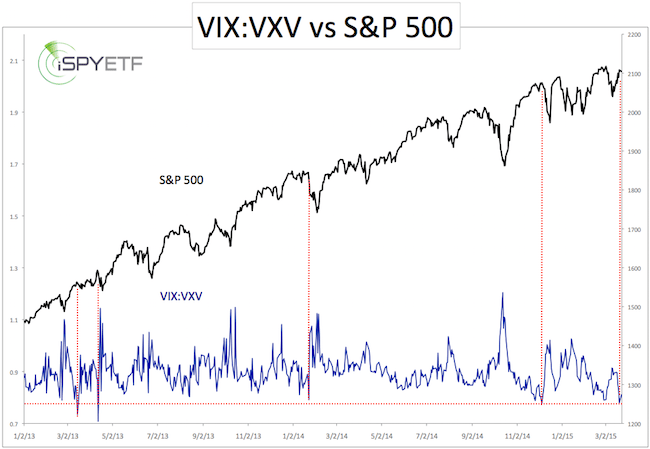 This means VIX traders are less concerned about shorter-term (30-day) volatility than longer-term (90-day) volatility. You may be thinking short-term complacency is a contrarian indicator … and you are right. To provide a visual of short-term complacency, I’ve calculated the ratio between VIX and VXV and plotted it against the S&P 500. Prior sub 0.79 readings are highlighted with a dashed red line. The conclusion is more or less self-explanatory. This indicator has a pretty good track record and increases the odds of a S&P 500 (NYSEArca: SPY) pullback and VIX rise. Long VIX ETFs include the iPath S&P 500 Short-term VIX Futures ETN (NYSEArca: VXX) and VelocityShares Daily 2X ST VIX ETN (NYSEArca: TVIX). This is likely to be a short-term (3 – 10 days) trade. In terms of risk management; a VIX close below support at 12.70 would temporarily (as long as it stays below 12.70) suspend the potential for a spike. The latest American Association for Individual Investors (AAII) poll shows a significant drop in optimism. Only 27.2% of individual investors are bullish on stocks. That’s the lowest reading since April 2013. How powerful of a contrarian indicator is this? The chart below plots the S&P 500 against the percentage of bullish AAII investors. The dashed green lines mark bullish reactions to similar readings in the past, the red lines bearish reactions and the gray lines neutral (at least short-term) reactions. Well, there are six prior instances with two bullish, two bearish and two neutral outcomes. Not much of an edge. The AAII survey generally delivers noisy data and hardly ever works as a stand-alone contrarian indicator. 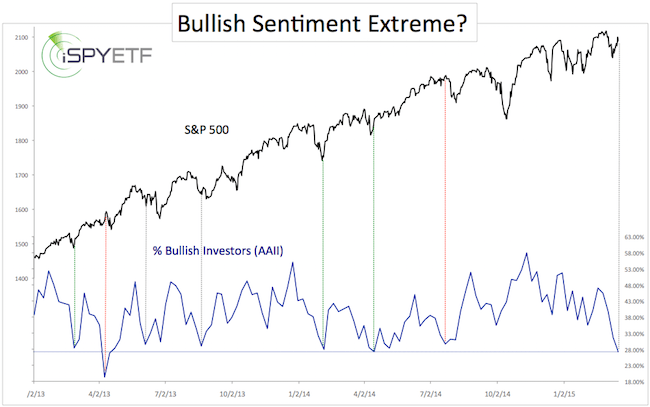 Compared with the many other investor sentiment gauges I follow, this reading stands out as a rogue extreme. It’s one of those data points that should be taken with a grain of salt, but as long as the S&P 500 stays above 2,100, it shouldn’t be ignored either. Small Caps Lead Market – Good or Bad Omen? The Russell 2000 index of small cap stocks just pushed to new all-time highs. Is this bullish for stocks? 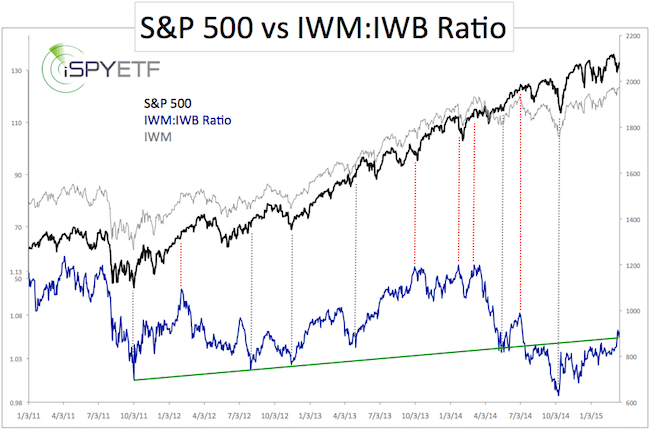 To find out, I’ve plotted the S&P 500 against the IWM:IWB (small cap/large cap) ratio. IWM is the iShares Russell 2000 ETF (NYSEarca: IWM). IWB is the iShares Russell 1000 ETF (NYSEArca: IWB). Based on the ratio (currently at 1.06), the recent outperformance is by no means extreme. What if we pretend for a moment that small cap outperformance was extreme (reading of 1.10 or greater)? The red lines mark prior periods of small cap outperformance (IWM:IWB > 1.10). The S&P 500 (NYSEArca: SPY) couldn’t care less. If anything, one could make an argument that extreme small cap underperformance works as buy signal. The dashed gray lines highlight readings smaller than 1.03. The gray overlay of the iShares Russell 2000 Small Cap ETF (IWM), makes it clear that IWM is only trading 3% above where it was a year ago. The S&P 500 gained 13% since March 2014. Small caps are often portrayed to be the engine that pulls the train (or at least the canary in the mine), but that’s not true. We dispelled this myth in July when many jumped on the ‘small caps are down, the market’s going to crash’ bandwagon. Perhaps recent small cap outperformance is a reflection of the idea that a strong dollar hurts multi-national large caps with overseas income more than small domestic companies. But what happens if dollar strength takes a breather? One more thought: Historically, small caps tend to under perform in the later stages of a bull market.